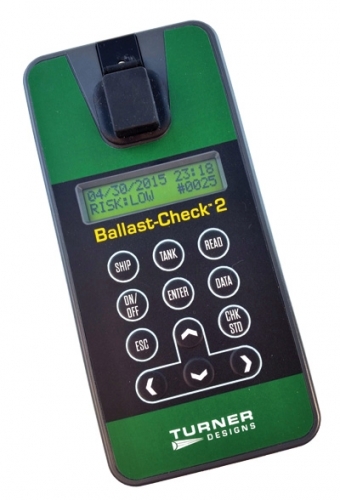 The Ballast-Check™ is a small, lightweight, highly durable handheld fluorometer ideal for quick indicative compliance checks of the ballast water regulation for algae in the 10-50µm size class. Factory set, the Ballast-Check 2 is ready for use right out of the box, no calibration necessary. Precision and accuracy of the Ballast-Check 2 are optimized for ballast water regulations. Extremely simple one-button measurements display estimates of both algal abundance and algal activity, providing ship crew or port state control with an indication of risk for gross exceedance of the regulation. The Ballast-Check 2 is ideal for quick on-the-spot, when you want it, assessment of the effectiveness of a Ballast Water Treatment System.